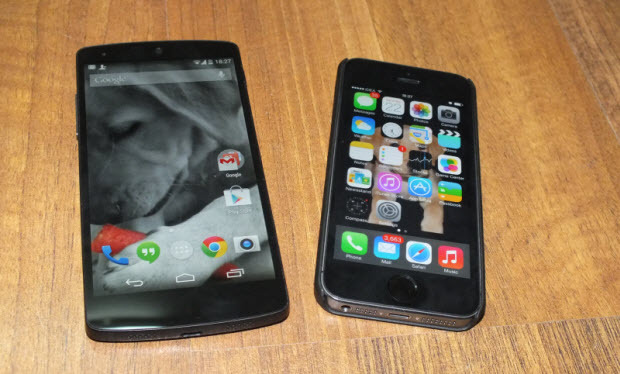 Android phones like Nexus 5 is packed with Wi-Fi direct, NFC etc to make it network friendly and to share large files with each other at faster speed. On the other hand, even latest iPhone models are not having Wi-Fi Direct or NFC. In that case, if someone wants to receive or share large files like media files then what are the options. Bluetooth has come a long way with version 4.0 which is available in latest iPhone. But Apple made it very difficult to connect non-Apple devices with Apple devices like iPhone and iPad for security reasons. 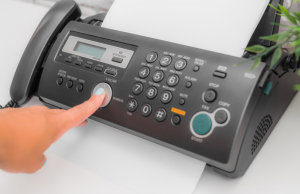 If you have to receive a large media files from your friend who is having an Android, it becomes difficult sometimes or you may need to use a cloud based service like Google Drive or Dropbox as a mediator. To offer a convenient way for data transfer, few awesome apps started appearing on App Store. One of the very popular app was Bump which was using its own server to check the accelerometer readings and was using its own server as an intermediate place to transfer the files. But finally Google acquired the company for $30 Million and shutted down this service in Feb 2014. So now what are the options left. There is no Bump any more but still we have awesome people working on different things. Here is how you can transfer files between Android and iPhone or between Android devices with blazing speed. 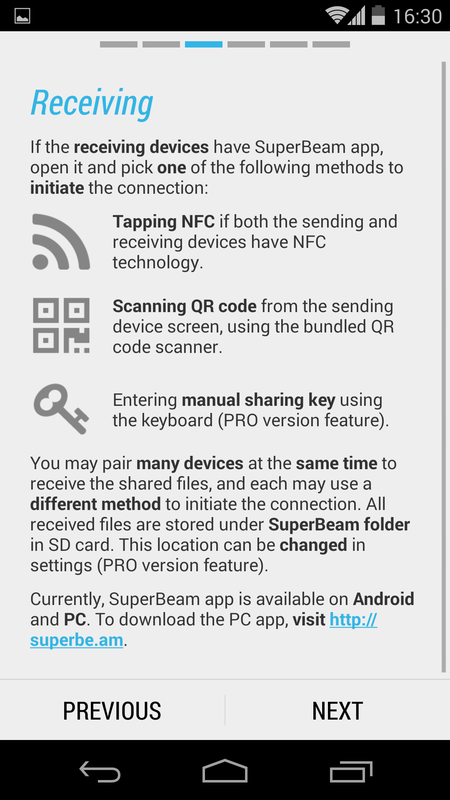 SuperBeam is available on Google Play for Android devices. It uses Wi-Fi direct or Wi-Fi hotspot via NFC to send or receive files at a blazing speed. Install this app on Android phone. 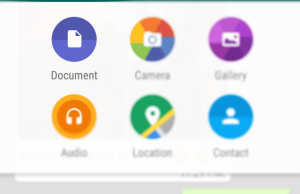 Now you can see a new option named ‘Superbeam’ under sharing options available on different apps like gallery, contacts, folders etc. Here are the screenshots takes from Android Nexus 5 running KitKat. 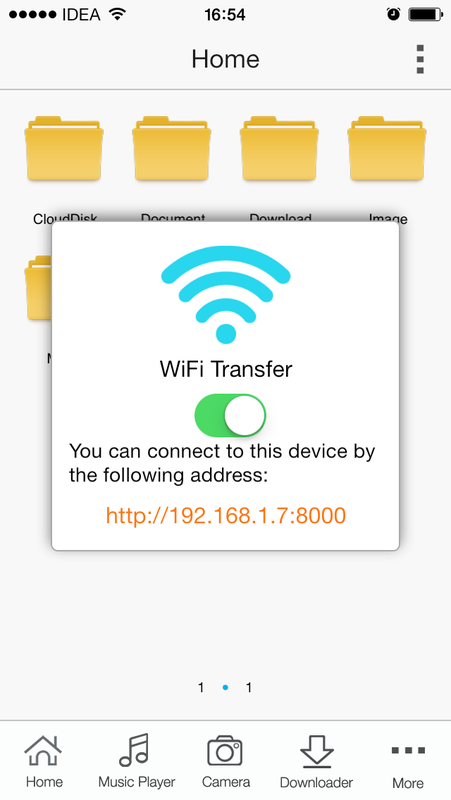 The SuperBeam app provides a URL (network URL with 8080 port) to download the shared files. 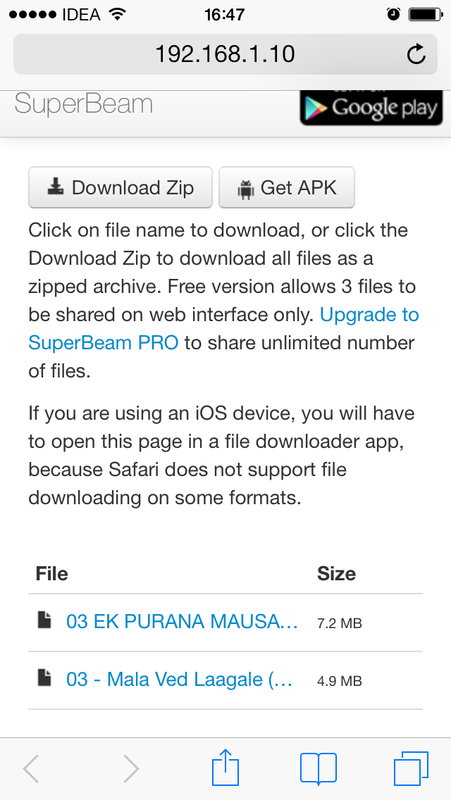 iPhone App Store is not having SuperBeam but there are apps to let you download the shared files over Wi-Fi network. 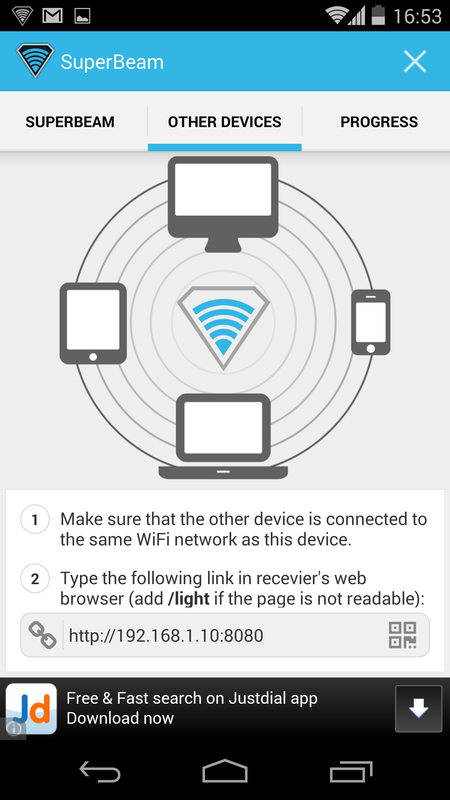 Once the file is shared from Android phone, there are multiple option to receive the same on other device. You need to download a File Downloader app on iPhone to receive the shared files. I tested the same with a good app named “FileMaster – File Manager and Downloader”. Go to the “Downloader” option available in bottom bar. 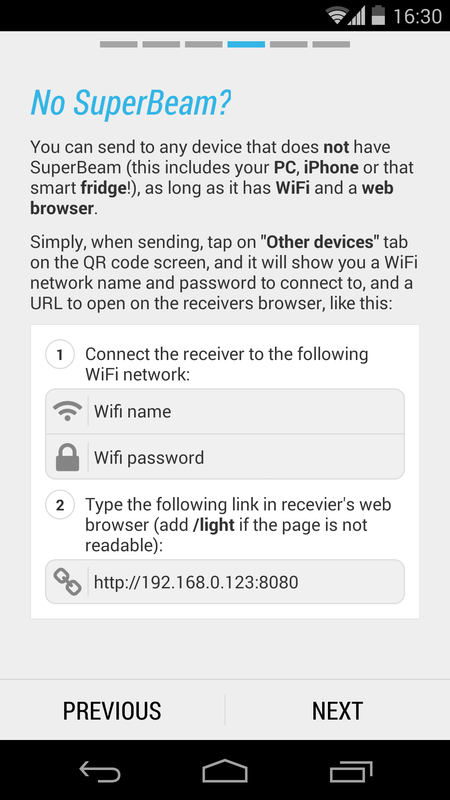 There you need to enter the home network URL supplied on Android Superbeam App under “Other Devices” option. You can download the files from FileMaster screen and save it on your iPhone. I tries with 500 MB file and it took just few seconds on my network. Screenshots taken on iPhone 5S with FileMaster receiving files from same Android Phone running SuperBeam. Unlike Bump, you can share or receive all type of files e.g. media files, pictures, contacts etc. using this method. Update – You can open the same URL on PC or laptop to download the shared files from SuperBeam.